Short Stirling je bil štirimotorni težki bombnik, ki so ga zasnovali v 1930ih pri Short Brothers. Bil je prvi britanski težki štirimotorni bombnik 2. svetovne vojne. Prvi let je bil 14. maja 1939, v uporabo je vstopil leta 1941. 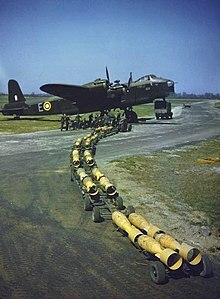 Kot strateški bombnik se je uporabljal malo časa, kmalu sta ga nadomestila bolj sposobna Handley Page Halifax in Avro Lancaster. Se je pa Stirling naprej uporabljal kot tovorno letalo in kot vlačilec vojaških jadralnih letal. ↑ Angelucci, Enzo (1988). Combat aircraft of World War II. ISBN 0-517-64179-8. ↑ "Stirling." raf.mod.uk. Retrieved: 27 December 2009. Barnes, C. F. (1967). Shorts Aircraft since 1900. London: Putnam. OCLC 493114510. Bashow, D. L. (2005). No Prouder Place: Canadians and the Bomber Command Experience 1939–1945. St. Catharine's, Ontario: Vanwell Publishing. ISBN 1-55125-098-5. Bowyer, Michael J. F. (2002). The Stirling Story. Manchester, UK: Crécy. ISBN 0-947554-91-2. Buttler, T. (2004). Fighters & Bombers, 1935–1950. British Secret Projects III. Hinckley, Kent, UK: Midlands Publishing. ISBN 978-1-85780-179-8. Gomersall, B. (1979). The Stirling File. Tonbridge, Kent, UK: Air Britain and Aviation Archaeologists Publications. ISBN 0-85130-072-3. Hall, A. W. (1998). Short Stirling. Warpaint 15. Milton Keynes, Buckinghamshire, UK: Hall Park Books. OCLC 826644289. Mason, F. K. (1994). The British Bomber since 1914. London: Putnam Aeronautical Books. ISBN 0-85177-861-5. Mondey, D. (1994). British Aircraft of World War II. London: Chartwell Books. ISBN 0-7858-0146-4. Peden, M. A. (1979). A Thousand Shall Fall. Stittsville, Ontario: Canada's Wings. ISBN 0-920002-07-2. Winchester, J. (2005). The World's Worst Aircraft: From Pioneering Failures to Multimillion Dollar Disasters. London: Amber Books. ISBN 1-904687-34-2. Bowyer, Michael J.F. The Stirling Bomber. London: Faber and Faber Ltd., 1980. ISBN 0-571-11101-7. Falconer, Jonathan. Stirling Wings: The Short Stirling Goes to War. Stroud, Gloucestershire, UK: Budding Books, 1997. ISBN 1-84015-004-1. Mackay, Ron. Short Stirling in Action, Aircraft Number 96. Carrollton, Texas: Squadron/Signal Publications Inc., 1989. ISBN 0-89747-228-4. Norris, Geoffrey. The Short Stirling, Aircraft in Profile Number 142. Windsor, Berkshire, UK: Profile Publications Ltd.,1966. No ISBN. Peden, Murray. A Thousand Shall Fall: The True Story of a Canadian Bomber Pilot in World War Two. Toronto: Dundurn, 2003. ISBN 978-1550024548. Potten, Charlie. 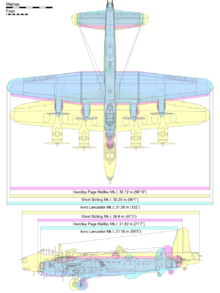 "7 x X x 90" (The Story of a Stirling Bomber and its Crew). Self-published, 1986. "First Details of Great Britain's Biggest Bomber: A Four-engined Type with Fighter Manoeuvreability." Flight, 29 January 1942. pp. 94–101. Short Stirling Remembered, Air History Series No. 1. Kidlington, Oxford, UK: Wingspan Publications, 1974. ISBN 0-903456-03-6. Čas zadnje spremembe strani: 09:39, 17. januar 2017.